Biddick Academy were crowned Tyne and Wear under-15 girls county champions, while fellow Sunderland school Oxclose Community Academy won the boy’s title. South Shield’s St. Wilfrids RC College won the under-13 girl’s competition and North Tyneside’s Churchill Community College took the honours in the under-13 boy’s tournament. The competition was hosted by Tyne & Wear Sport in partnership with Newcastle Vikings Handball Club and Sunderland Handball Club, at the Vikings’ home match venue Temple Park Leisure Centre in South Shields. More than 150 teams from schools from all of the five Tyne & Wear districts took part in an action-packed day. The top three sides in each competition were presented with gold, silver and bronze medals by Tyne & Wear Sport’s School Games Co-ordinator Claire Lee. The winning teams will have the opportunity to progress to the regional and then national county handball championships. 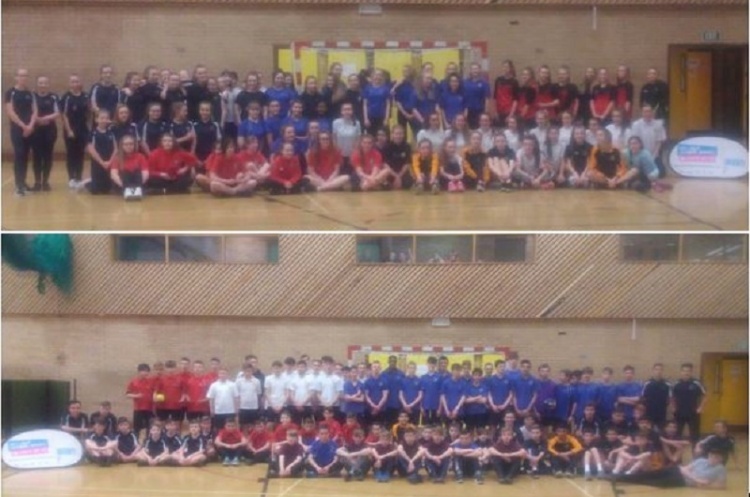 Tyne & Wear Sport, Newcastle Vikings Handball Club and Sunderland Handball Club would like to thank all the schools and children who took part in a great fun day. Meanwhile, the best players scouted from the area’s schools over the past season will take part in the third round of the Tyne & Wear county handball trials at Temple Park Leisure Centre on Saturday 18 March 2017 (10.00-12.00). The trials will be followed by a Newcastle Vikings juniors’ match and the Vikings ladies’ friendly against Edinburgh (1:30-3pm). Spectator entry for the day is free to watch all the action.